My desktop hard drive died this morning. It it toast. It is no more. It's no longer pinin' for the fjords. It is an ex hard drive. I hadn't backed anything up for a couple of weeks. I just lost all my photos, my address book, and a bunch of half finished stories, among other things. Crap. Crap. Crappity crap crap. Scenes from a hard drive autopsy. Lesson learned. I have a $50 certificate from Staples. Tomorrow, I'm using it to buy a 1G flash drive. With the instant rebate, it'll be $9. Dammit, I had a lot of stuff I hadn't saved. What an idiot. Oh - a little advice from me to you: don't buy from Gateway. Just don't. Really. 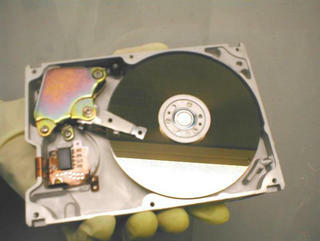 Sorry about the harddrive. Rotten when it happens. Yeah, and it's a lesson learned the hard way. But, now I have a nice little flash drive. 1G of power, power, power!